Only very general patterns of atmospheric movement are within the scope of this chapter, where they are pertinent because we are interested in discussing general movements of pollutants and other constituents of the atmosphere. Atmospheric circulation will thus be considered in an extremely simplified manner. Books on meteorology, such as the ones given in the Additional Reading at the end of this chapter, may be consulted for further details. There are two major reasons for the existence of a general circulation of the atmosphere. 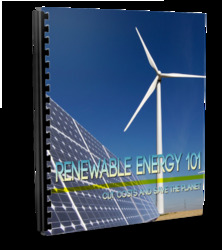 First of all, the equatorial regions on earth receive much more solar energy all year round than the polar regions. Hot air therefore tends to move from the equator to the poles, while cold air tends to move from the poles toward the equator. As we shall see, the surface of the earth absorbs a much larger proportion of the solar radiation than the atmosphere above it. Thus, in the troposphere, the air is heated by conduction, convection, and radiation from the ground. There is also some heating of the atmosphere when water vapor, recently evaporated from the earth's surface, condenses to form clouds. FIGURE 2-5 General circulation of the atmosphere as proposed by Hadley, 1735. These were the simplest forms of "Hadley cells,'' with hot air rising near the equator and moving toward the poles in the upper troposphere. Cold air, in this model, moves from the poles toward the equator near the surface of the earth. following major oversimplifications in his model. First, this model showed a lot of air accumulating over the polar regions; second, no account was taken of unequal heating of land and sea; and, third, no account was taken of variations in solar radiation at various latitudes at different times of the year. What happens when the rotation of the earth from west to east is taken into account? 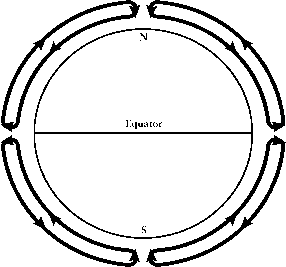 If we think of the earth as rotating around an axis that goes through the North and South Poles, we note that the surface of the earth at the poles does not rotate, while the surface of the earth at the equator rotates very quickly. The equatorial circumference of the earth is about 40,000 km, and one rotation occurs every 24 h, so that every point on the earth's equator is constantly moving at a velocity of 28km/min in contrast to the stationary points at the poles. In the same way, the air above the poles does not rotate while the air above the equator rotates with the earth, and at the same velocity. Between the equator and the poles, points on the earth's surface and in the atmosphere above these points rotate at intermediate speeds, between zero and 28 km/min. When air moves between latitudes in which the speed of rotation is different, it is subject to the Coriolis effect, which gives the wind speed an unexpected component with respect to an observer on earth. For example, when a parcel of air moves from one of the poles toward the equator, it is moving from an area where little or no rotation is taking place to an area where the earth is rotating quickly beneath it. This parcel of air tends to lag behind the rotating earth, that is, the earth is rotating away from this parcel of air, moving faster than the parcel of air from west to east. From the perspective of an observer who is rotating with the earth, this parcel of air seems to be moving backward (i.e., from east to west). In the Northern Hemisphere, where the parcel of cold air near the surface of the earth is moving north to south because of unequal heating, the overall result is to give this parcel of air a northeast-to-southwest motion with respect to someone on the earth's surface. We should therefore expect surface winds in the Northern Hemisphere to blow generally from the northeast. Similar reasoning would lead us to expect surface winds in the Southern Hemisphere to blow from the southeast. FIGURE 2-6 An extremely simplified version of prevailing wind patterns on the earth's surface. Polar easterlies, especially, are relatively insignificant. hemispheres seem to be blowing in the wrong direction, at least according to Hadley's original ideas, moving from the southwest instead of the northeast in the Northern Hemisphere and from the northwest instead of the southeast in the Southern Hemisphere. 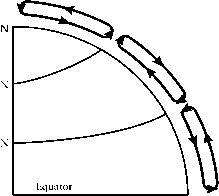 Air is therefore flowing from the equator to the poles along the surface of the earth in these midlatitude regions, and is moving from a more rapidly rotating region of the earth's surface to a more slowly rotating region. Thus, these portions of the atmosphere are moving west to east faster than their destination, and the winds, which are a manifestation of this moving air, have a westerly component. In summary, therefore, near the equator and near the poles, cold air is moving toward the equator near the surface of the earth with an apparent easterly (east-to-west) component, while, in the midlatitudes, warm air is moving from the equator toward the poles along the surface of the earth with a westerly (west-to-east) component. As stated earlier, these easterly and westerly components of winds moving between portions of the earth that rotate at different speeds are manifestations of the Coriolis effect. 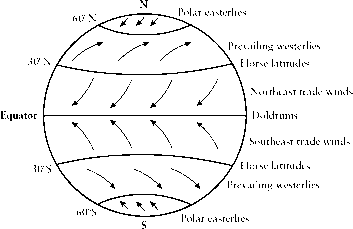 FIGURE 2-7 Three-cell model of general atmospheric circulation in the Northern Hemisphere. 1941, is also quite oversimplified because it gives the appearance that the cells are fixed in place and that there is almost no air circulation between cells. In fact, the boundaries of the cells move, and the mixing of parcels of air coming from different parts of the globe varies quite a bit with the seasons (see Section 5.2.3.3). Nevertheless, the three-cell model is a great improvement over the one-cell model because any model that has only easterly winds all over the globe is impossible. Such unidirectional winds would tend to slow down the earth's west-to-east rotation. In fact, easterly and westerly winds must balance on the average, since the atmosphere as a whole rotates with the earth. This fact was ignored in the single-cell model. 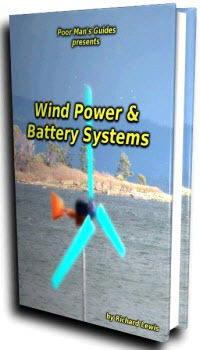 The simple scheme shown in Figures 2-6 and 2-7, although it explains the major prevailing wind systems on the earth's surface reasonably well, cannot adequately explain numerous other atmospheric phenomena. These include the so-called jet stream in the upper troposphere, which flows west to east, the systems of low and high pressure with circulating winds that constitute our weather systems, and the general west-to-east movement of these weather systems. It turns out that a good deal of energy is transmitted from the equatorial regions to the polar regions by these so-called cyclone and anticyclone weather systems. Further explanations are outside the scope of this chapter. Let us just note here the results of experiments with model liquid systems (i.e., suspensions of metal powders in liquids under conditions that simulate conditions in the earth's atmosphere) have shown, under certain conditions, flow patterns that correspond to the type of air circulation in cyclones and anticyclones and the slow drift of these flow patterns in the direction of motion of the fastest moving portion of liquid. The circulation experiments are carried out as follows. A liquid suspension is placed between two cylinders; the inner cylinder is cooled and stationary, while the outer cylinder is heated and rotating. The metal particles in the suspension can be seen in motion back and forth between the stationary cold cylinder wall and the rotating warm cylinder wall. Eddies sometimes form, and these can be seen moving in the direction of rotation of the outer cylinder, but much more slowly. Figure 2-8, taken from a report of one of these experiments, permits us to visualize the patterns that are observed. Both the steady waves and the irregular patterns in Figure 2-8 look somewhat like diagrams of the upper atmosphere jet stream seen with the North Pole at the center. The jet stream, observed in this way, has lobes going alternately north and south in which air travels generally west to east, in the direction of earth's rotation. The jet stream moves in the middle latitudes of the hemisphere. FIGURE 2-8 Drawings made from photographs illustrating three typical top-surface flow patterns of free thermal convection in a wall-heated rotating fluid annulus; inner wall at 16.3°C; outer wall at 25.8°C; working fluid, water. From R. Hide, "Some laboratory experiments on free thermal convection in a rotating fluid subject to a horizontal temperature gradient and their relation to the theory of global atmospheric circulation," In The Global Circulation of the Atmosphere (G. A. Corby, ed.). Royal Meteorological Society, London. Copyright © 1969. Used by permission of the Royal Meteorological Society. rainfall over New England (northeastern sector), as mentioned earlier. Both the jet stream (in the upper troposphere) and our general weather systems contribute to the west-east motion of polluted air over the continental United States. There is also some north-south and south-north movement of polluted air at different times, especially between our industrial Midwest and south-central Canada. Furthermore, in Europe, polluted air seems to move generally southwest to northeast, causing problems for the Scandinavian countries which are thus in the path of pollutants transported from the United Kingdom and from central Europe. At one time, people believed that virtually all the heat transfer from the equator to the poles occurred via the earth's atmosphere. It is now surmised that ocean currents like the Gulf stream perform about 50% of all heat transport between the equator and the poles; only half the heat is transported by the atmosphere. What powers the circulation of the atmosphere?